The Saturday after Thanksgiving 2018 I traded in my 2015 Nissan Murano for a 2018 Jeep JK Wrangler Unlimited Altitude Edition. You can read more about that and other Jeep content at my Pixel Hiker website. Along with buying the jeep I came to the conclusion that after 6 years of service it’s also time to upgrade my Thule T2 bike rack which has been deteriorating and is in need of parts. I thought buying a new rack would be easy but wow was I wrong. When I began looking at bike racks for my Jeep I thought finding the best bike rack for my JKU wrangler would be an easy task simply because there’s so many Jeeps on the road that there must be a great solution from the big name manufacturers. I was wrong. If you are reading this and not a Jeep Wrangler owner I will point out a few challenges of putting a bike rack on a Jeep. Spare Tire Mount Bike Rack: Many folks instantly look to spare tire mounts. For the most part this is a poor choice for a couple reasons. For starters most spare tire mount racks support the bike by the top tube or a special bar that replicates a top tube of a bike frame. Generally these types of racks allow bikes to bounce all over the place. This is definitely not ideal on a Jeep. Then there’s the matter of weight capacity. The factory spare tire mount is designed to support the weight of the factory spare tire and that’s it. Weight beyond that requires a different kind of mount and an expensive mount on top of that. Spare Tire Clearance: Because a Jeep carries the spare tire on the tailgate the depth of the tire has to be considered when using a Class 2 or Class 3 hitch. On a typical vehicle with a Class 2 or 3 hitch the hitch typically fits somewhere just below the bumper give or take a couple inches. Most hitch mount bike racks are designed to allow for this. On a jeep you need to allow more distance, nine to twelve additional inches is not uncommon. Factory Hitch: Tied into the previous section is the factory Jeep hitch. The factory hitch is located a few inches under the vehicle which compounds the depth issue. If an aftermarket hitch such as a Draw Tite is used a few inches can be gained and a shorter extension can be used. Tailgate Access: Getting access to the Jeep through the tailgate with bikes on the rack is also important. Some racks swing out of the way by design, others swing out of the way through the addition of an expensive add-on articulating arm. Other bike racks simply tilt forward to allow access to the tailgate. Unfortunately while those systems work well on most cars and SUV’s often the Jeep spare tire once again becomes an obstacle. Many bike racks will see some sort of interference with the tire. This interference can create a difficulty actuating the tilting or locking mechanism, the interference can also simply be the tire preventing the rack from swinging, pivoting or articulating. Note: Owners of the new JL series Jeeps also have a backup camera to deal with. Just about ant bike rack will obstruct the rearview camera of the JL to some degree. My needs are simple. 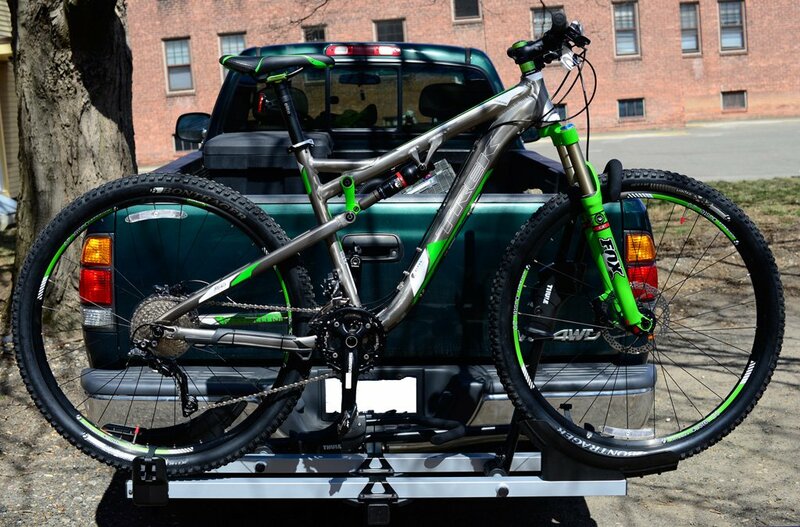 I want a platform or equivalent style rack, tailgate access and two 29’er sized bike capacity, 2″ receiver. I spent a solid disappointing afternoon and came up with the following list of what is generally accepted as the Best Jeep Bike Racks. 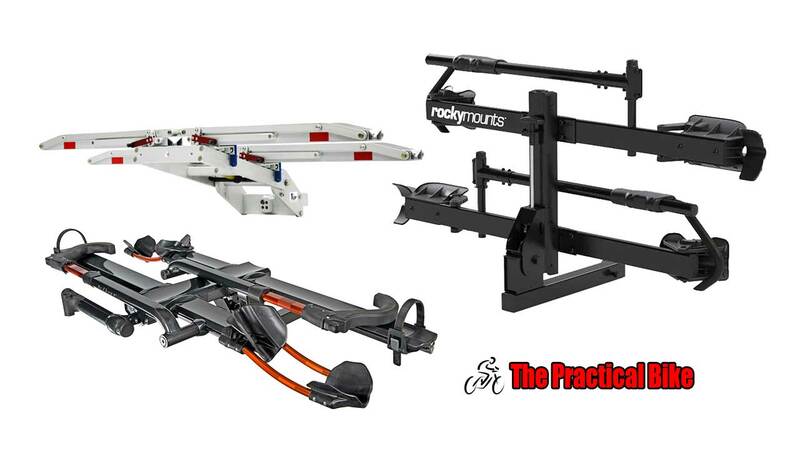 Below is a list of the best hitch mount racks based on my search of the various Jeep forums, mountain bike forums, online magazine reviews and personal blogs. So this leads me to the bottom line of this post, What is the Best Hitch Bike Rack for a Jeep Wrangler? I have narrowed my selection to the list above but haven’t settled on any of of them though I am leaning heavily towards the 1up and Kuat offerings. Please let me know your experiences with these hitch mounted bike racks and if you have a suggestion of a rack I failed to mention please let me know that too in the comment section at the bottom of this page!